1gynRat258 asked the Hard Drives, NAS Drives, Storage forum if one should scan a flash drive or an external hard drive for malware--such as a virus or Trojan. I see no point in scanning every external drive every time you insert it. That becomes very annoying very fast. Yes, some antivirus programs do this automatically, but if yours does, I strongly recommend you turn the feature off. Which isn't to say that you should never scan an external drive. Of course you should--when you think it's appropriate. If someone gave you the drive, or if it has some new software on it, scan it immediately the first time you plug it in. And, of course, you should scan a drive if you have reason to suspect that it was on an infected computer. To scan a flash or external hard drive, insert it into a USB port. Ignore the dialog box that asks what you should do with the drive. Instead, click Start, then Computer (or My Computer), right-click the drive and select the option to scan for malware. That option will almost certainly contain the name of your antivirus software. But what if the drive launches an Autostart? That's not the issue it once was. 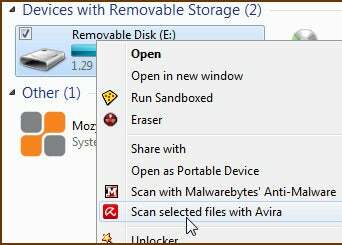 In current Windows versions, nothing on an external drive opens automatically when you plug it in.